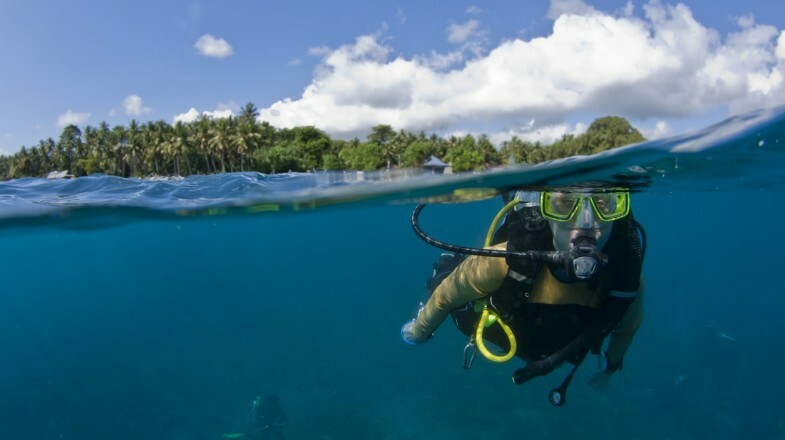 Diving in Bali is suitable for divers of all levels. Scuba divers of all levels are able to enjoy the warm turquoise waters around the island of Bali. A plethora of big fish, including sharks and rays, and excellent levels of visibility make delving beneath the waves here a must-do activity. But where are the best dive sites in Bali? You’ll find our top 10 below. Scuba diving in Bali can be roughly divided into three zones. In Bali’s south zone is Nusa Penida. 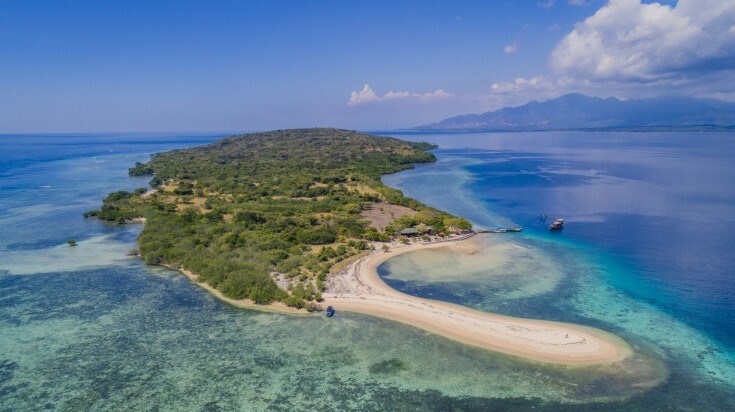 Its east zone includes Candidasa, Amed, Padang Bai and Tulamben, while the west coast zone is home to sites including Menjangan Island and Permutaran. 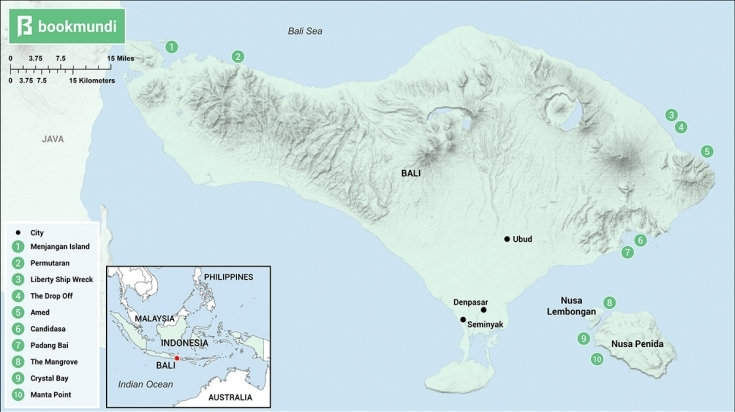 Map of Bali showing the best diving locations. Menjangan Island is a great place to go on a day tour for snorkeling and scuba diving. Menjangan Island or Pulau Menjangan, gives divers the chance to discover walls colorful with smaller fish which plunge for 40 meters. Covered in gorgondian sea fan corals and sponges, the plummeting sheer rock walls are also studded with small caverns. Though diving the wall sounds technical, the light currents and expansive visibility make it suitable for beginners, who can also dive the reef flats at 10 meters depth. 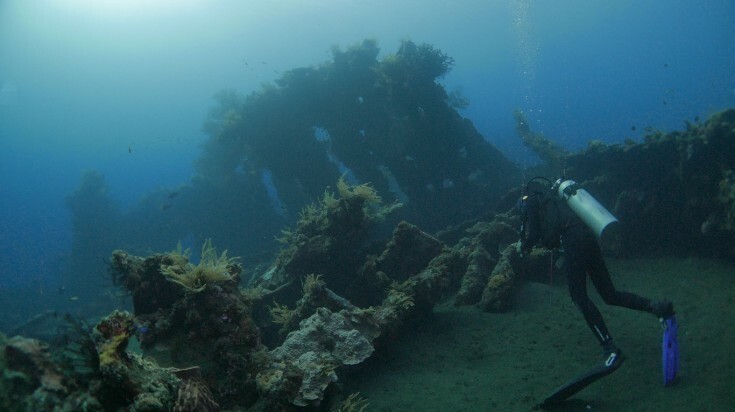 Advanced divers will love the 150 year old Anker Wreck, at 40 meters. Good to know: The depths achieved around the island means it has the highest level of decompression sickness of any Bali diving site. Take ascents slowly, respecting safety stops. Check out this one-day snorkeling tour in Menjangan Island. Given its name, you won’t be surprised to learn that it’s possible to see manta rays here all year round — to the extent that some dive operators will give you your money back if you don’t see any. The giant fish use the waters around beautiful limestone cliffs as a regular cleaning station, with smaller fish species picking parasites from the rays’ rough skin. Good to know: This site can get busy. Avoid overcrowding the rays by coming in the morning, when conditions also peak. 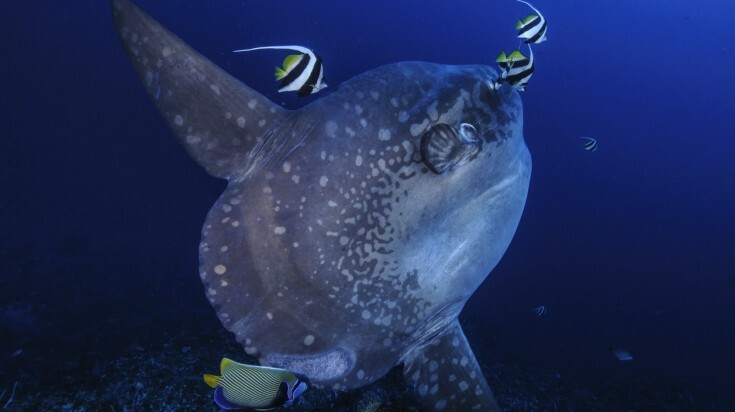 You can spot the giant Mola Mola when going diving at Candidasa. The best dive sites of Candidasa can be found around the small islands of Tepekong, Biaha, Mimpang and Selang. These islands are famed for the many shark species which visit their waters, including Blacktip Reef sharks, and rarer Wobbegong and Cat sharks among others. Between August and October it’s also possible to encounter Sunfish (Mola Mola), while the corals are also worth exploring. Good to know: The water can be a little chilly, with most divers preferring to make use of a 3 mm wetsuit. Nusa Penida is also known for its famous Kelingking beach. 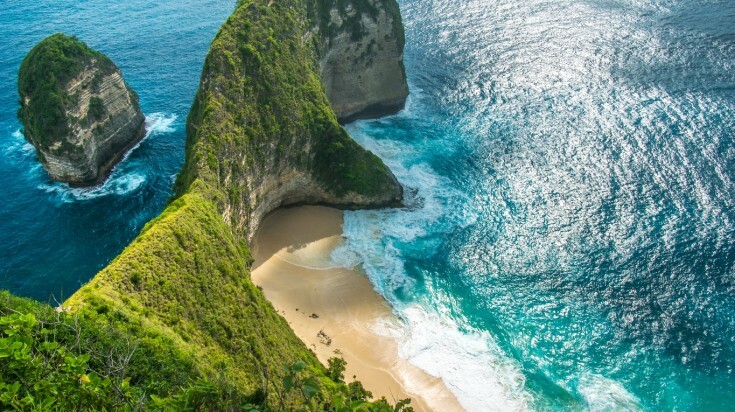 Nusa Penida, the largest of three islands southeast of Bali’s main island, is another area of incredible dive sites where it’s possible to catch sight of Sunfish at the right time of year. While most dive operations are based on neighboring Lembongan Island, the best chances of seeing Sunfish are to be had at their cleaning station of Crystal Bay, near Penida village. Good to know: Due to the popularity of seeing a Sunfish, dives can get booked up ahead of time between August and October. Scuba diving in Amed is a relaxing experience since there is very little current to contend with. Many of the dive sites are available from the shore (the corals here can be snorkeled too) or with a short boat trip, making it an affordable place to try your hand at diving for the first time. The black sands created by the ash from nearby Mount Agung makes a great contrast to other sites in Bali, while ghost pipefish, seahorses, and mimic octopus have all been recorded here. 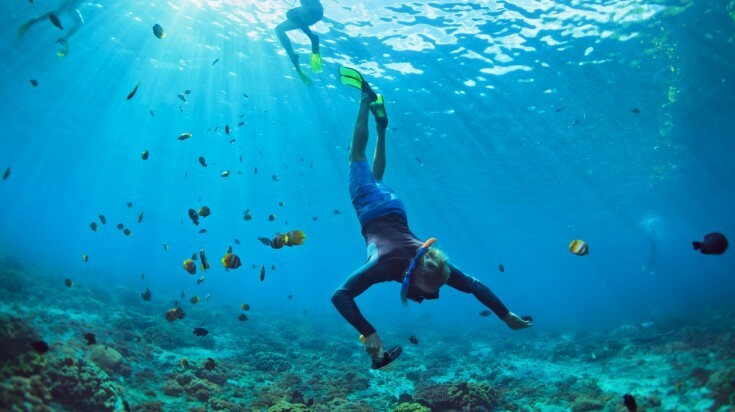 Good to know: Because Amed is a shallow water dive site, you can spend more time underwater with the diving time only being limited to air consumption. The wreck of the USAT (United States Army Transport) Liberty at Tulamben is probably one of the world’s easiest wreck dives. But that takes nothing away from the phenomenal sight of this 120 m long ship resting on the sea bed. It gives beginner divers the chance to dive a world-class wreck, and allows those with more experience to delve deeper and witness the bow gun and its covering of corals where there are also pygmy seahorses. Good to know: The Liberty was sunk during World War II by a Japanese torpedo, and is now home to schooling fish, Blacktip Reef sharks and barracuda among other species. Aerial view of Padang Bai. 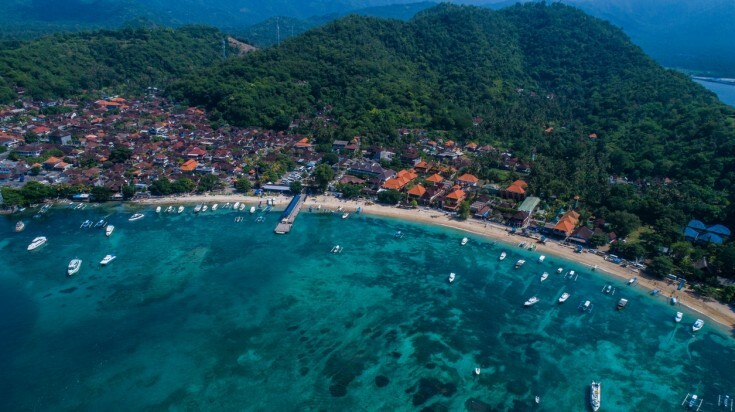 Considered to be some of the best diving in Bali, there are several great sites just a few minutes from the shoreline of Padang Bai, ranging from those perfect for beginners to more challenging dives. The Blue Lagoon is probably the premier diving spot here, combining a sheltered location, good visibility and a myriad of colorful fish species to enjoy. 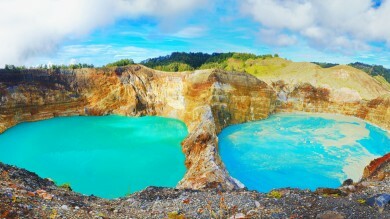 Good to know: You can also opt for a night dive in the Blue Lagoon, for a different take on this diving experience here. The Temple Garden site here was created by divers in an attempt to conserve the local sea life. To do so they came up with the idea of creating an underwater temple, with a four meter high temple gateway and statues of Buddha, Krishna and Ganesh. It’s fair to say their attempts have been successful, with divers able to delight in the sea fans that have made the temple their home. Good to know: The original temple lies at a depth of 30 meters, with a shallow section created to attract beginner divers. The most exciting dive site around Tulamben beside that of the Liberty Ship Wreck is The Drop Off. Similar to the wall on Menjangan Island, The Drop Off is a sheer fall of rock, created by a flow of lava from Mount Agung in 1963. For diving, the site offers a huge diversity of sea life, and the chance to learn new technical skills such as trimix deep diving as the depth increases. Good to know: The site can be accessed from wading out from the shore. Nusa Lembongan is a dive site with crystal clear visibility. No longer just a surfers’ paradise, the best-known dive site off the coast of Lembongan Island is called the Mangrove. A drifting dive site with crystal clear visibility to the north of the island, it is home to a beautiful garden of corals. What’s more, warm sea temperatures make it a pleasant dive site at any time of year. The Mangrove is a particularly good site for divers who enjoy some current while underwater. Alternatively, head to Blue Corner (for Sunfish), or Long Point. Good to know: Though Nusa Lembongan is considered a good place for drift snorkeling, scuba divers need to be in complete control of their buoyancy to enjoy greater depths here safely, making it unsuitable for most beginners. Bali is a good place to dive all year around, however conditions are best during the dry season, which lasts from April until November. For a chance to see Sunfish you’ll want to be diving between August and October, which is also peak tourist season for diving. Bali is a paradise for scuba divers at all levels of ability. Beginners will love the waters around Menjangan Island, Manta Point and Amed among other sites, while those with a little more experience should visit the Liberty Ship Wreck, Padang Bai and Permutaran. Advanced divers are also catered for, with sites including Candidasa, Nusa Penida, and Nusa Lembongan.